Are you wondering what delicious, mouthwatering options there are for pizza in 89102, Las Vegas? Pop Up Pizza is serving up home made pizza in downtown Las Vegas at the Plaza Hotel & Casino, located at 1 South Main Street. Why are we the best? Come try one of our delicious and unique pizzas, always made fresh to order with quality ingredients and you’ll find out. Our signature pizzas range from the classic mozzarella cheese pie, to a pie with pepperoni flown in from Chicago, to a vegetable vegan option, plus many more delightfully delicious pies. Or, create your own custom pizza! Pop Up Pizza is the best destination for pizza in 89102. In addition to our signature pizza pies, we serve fresh salads, delicious classic bar foods like mozzarella sticks, garlic fries, and chicken wings, vegan soft swirl ice cream, and a selection of beverages ranging from soda to beer and wine. We also serve by the slice! Plus, get in on our deal: buy 9 slices and the 10th slice is free! Don’t want to venture outside? That’s OK, we deliver! Order online or give us a call at (702) 366-0049. 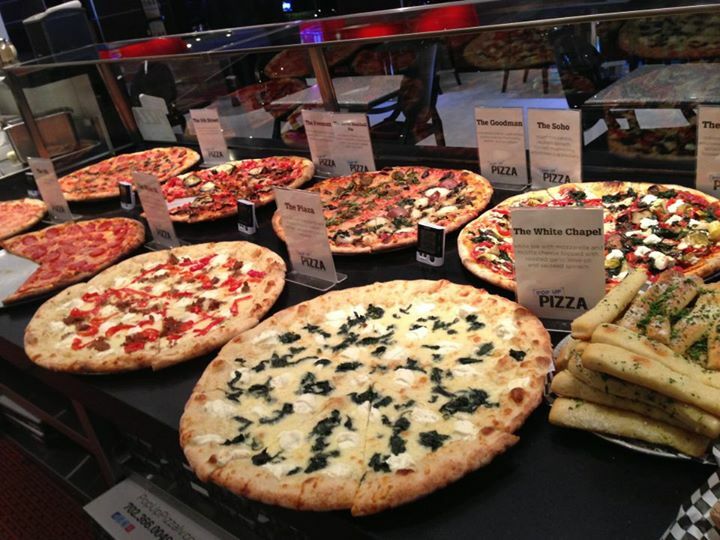 We’re open daily from 11 a.m. to 2 a.m. Come discover why Pop Up Pizza is dishing up the best Fremont Street food from our oven to your mouth!